Porcine deltacoronavirus (PDCoV) was first detected in Hong Kong and has recently spread to many countries around the world. PDCoV causes acute diarrhea and vomiting in pigs, resulting in significant economic losses in the global pork industry. In this study, a Chinese PDCoV strain, designated CHN-HG-2017, was isolated from feces of a suckling piglet with severe watery diarrhea on a farm located in central China. 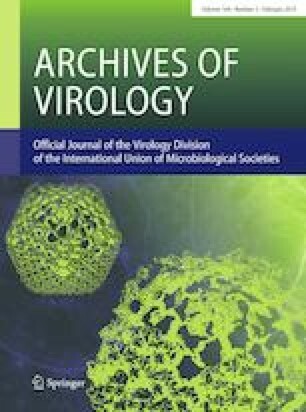 Subsequently, the virus was identified by an indirect immunofluorescence assay and electron microscopy. A nucleotide sequence alignment showed that the whole genome of CHN-HG-2017 is 97.6%-99.1% identical to other PDCoV strains. Analysis of potential recombination sites showed that CHN-HG-2017 is a possible recombinant originating from the strains CH/SXD1/2015 and Vietnam/HaNoi6/2015. Furthermore, the pathogenicity of this recombinant PDCoV strain was investigated in 5-day-old piglets by oral inoculation. The challenged piglets developed typical symptoms, such as vomiting, anorexia, diarrhea and lethargy, from 1 to 7 days post-inoculation (DPI). Viral shedding was detected in rectal swabs until 14 DPI in the challenged piglets. Interestingly, high titers of virus-neutralizing antibodies in sera were detected at 21 DPI. Tissues of small intestines from CHN-HG-2017-infected piglets at 4 DPI displayed significant macroscopic and microscopic lesions with clear viral antigen expression. Our analysis of the full genome sequence of a recombinant PDCoV and its virulence in suckling piglets might provide new insights into the pathogenesis of PDCoV and facilitate further investigation of this newly emerged pathogen. This study was supported by the National Key Research and Development Program of China (2018YFD0501102), the China Agriculture Research System (CARS-35), and the Applied Basic Research Project of Wuhan (Grant no. 2017020201010227). Necessary approvals from the Scientific Ethics Committee of Huazhong Agricultural University (HZAUSW-2018-005) were obtained prior to the start of animal experiments. This article does not contain any studies with human participants performed by any of the authors.